Population Health Management (PHM) is one among the myriad technological innovations in the healthcare industry today, which uses Business Intelligence (BI) tools to aggregate the cluster of patient-related data and portray an overview of each patient’s clinical status systematically. As PHM provides enhanced transparency, clinicians and medical administrators can easily identify the care gaps that lie within the patient population. This gives them an opportunity to improve the quality of existing patient care, while saving time and expenses. Today's PHM tools incorporate a slew of new technologies for better management of health. Providers are actively exploring ways of using data, analytics and care coordination tools to manage population health and make value-based care a reality. Identifying this need, there are numerous solution and consulting providers who offer the latest and best-of-breed PHM solutions. Embedded with agility and efficiency, these solutions are transforming the entire population health management landscape. In this edition of Healthcare Tech Outlook, we bring to you “10 Most Promising Population Health Management Solution Providers - 2017 ,” featuring the best vendors providing PHM solutions and services in the healthcare industry. The companies featured in this edition showcase extensive business knowledge combined with innovative strategies and talent base across locations. 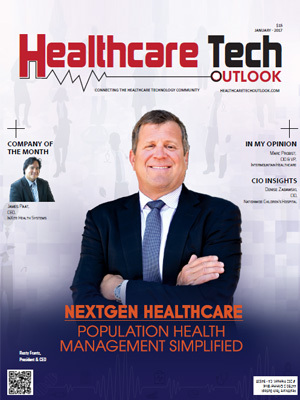 A distinguished panel comprising of CEOs, CIOs, VCs and analysts including the editorial board of Healthcare Tech Outlook selected the top companies that are at the forefront of tackling challenges in the Population Health Management market in the U.S.